We have a superb range of display products. With so many “me-too” products on the market it is difficult to know the good from the bad and what makes a good choice.Our selection is based on three factors: Performance, Image and Price. We have selected high quality well made products that look good, will last well and so provide you with the best value for your money. Our products can be used in every occasion when you want to expose your message – everywhere from the little foyer to big events and trade shows. Let the environment and your own creativity be your guide when choosing display system. Ready in 30 seconds! Roll Up is the world’s most common display system and ideal for frequent use at events and promotion activities. Our Roll Up comes in three different versions; Classic and Compact. Read more. A standard for large image walls – clever magnetic solution Pop Up Magnetic is used as a standard for large image walls. You also find the smart magnetic solution in our flexible Tower. A floor-standing double-sided display system that keeps all rigid board materials up to 18,5 mm in a firm grip. The panel stands straight and stable after fast and easy installation. Panel Base is also used as the base for Magnetic Frame. Read more. When you want to be seen outdoor. Our outdoor products give your message new possibilities to get 100% attention outdoors, in any type of weather! Read more. Pole System – Elevate your message! 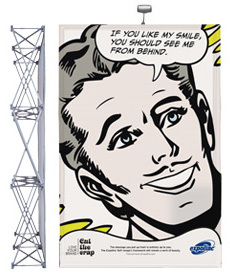 Pole System is the perfect system when you want to display your message up high. Ideal when you want to be seen in the middle of a room or in places where you want to see what is going on behind the graphics. The panel measurements are flexible both in height and width and you can make the system double sided. Read more. Soft Image – Packed and ready to go! The Soft Image display comes as simple as can be. You will be able to conjure up an entire display wall measuring meters wide in a matter of seconds. The fabric is stored and transported already mounted on the display and the low weight makes it easy to move. Read more. Soft Image Counter – Sleek and sturdy! Soft Image Counter is a sleek and sturdy meeting point. 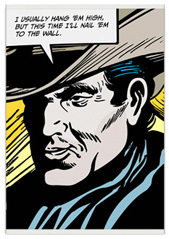 Use on its own or with a Soft Image to create a coordinated environment. Read more. 4 Brochure – Low weight and neat brochure stand! 4 Brochure consists of pockets on a transparent fabric. You can easily roll the system and transport it in a practical and discreet bag. Read more. 4 Screen is a cost efficient way of raising your message in large scale. Perfect for events and large campaigns when you have to consider price and the time it takes to put up the message. Read more. 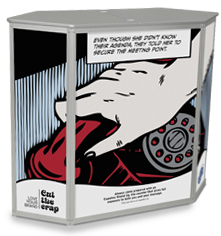 The Stand Up counters provide you with a natural meeting point, while giving full exposure to your message. 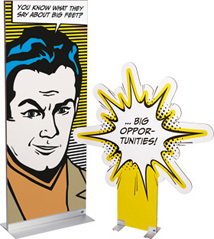 They can also be combined with our other display systems, thus making your stand or presentation complete. The Stand Up is easy to mount and has a solid construction. Read more. The perfect way to expose and transport brochures Brochure Stand is an ideal profiling medium in any environment and a perfect way to transport your brochures. Read more. 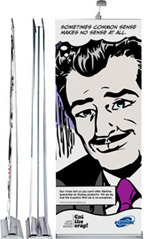 Graphic Profile is an aluminium profile for hanging posters and banners up to 0.8 mm in thickness. The image is attached with a snap, without screws or glue. The symmetrical shape and centred image, lets the profile hang straight and it looks identical from either side. There is no spring mechanism which allows it to be easily cut to desired length or drill in for mounting on a wall. Read more. Case & Counter – From case to counter in a minute! Our Case & Counter is a spacious transport case in a minute converted into a stylish and stable counter. The soft, rounded corners of the top shelf create an inviting meeting point with your message exposed on the cover of the case panel. The case is designed with straight corners to fully make use of the package space while in the same time it is easy to store and carry. Case & Counter is available as ready Pop Up packages but can also be used for transportation of other portable display systems. Read more. We have developed, designed and manufactured all of our products ourselves. Because of this we are all confident about the function and quality of the products and that is why we can offer a lifetime warranty on every purchase.